Sir,—The Irish Committee of Historical Sciences, the body which represents the interests of History as an academic discipline wishes to express the alarm of all university teachers of History in Ireland at the prospect that pupils in Irish secondary schools may no longer be required to study History up to Junior Certificate level. Our concern is aroused by the recommendation on the Junior Certificate curriculum which appears in the White Paper, Charting our Education Future (p.48), where History has been silently dropped from among the obligatory subjects listed in the recommendation, and is not even identified as one of those subjects to which every pupil should have access. This suggests that the authors of the White Paper would countenance the disappearance of History as a subject taught in secondary schools (it was never required in vocational or community schools) and it seems certain that, if the present requirement were removed, History would indeed give way to subjects that some consider to be less demanding on the time and resources of pupils, or more relevant to their employment prospects. Moreover, if History were reduced to the status of an optional subject its status would be further placed in jeopardy because of the inevitable pressures on school principals to find space in the timetable for new subjects. For example, it seems reasonable to expect that once official recognition is given to Religion as an examination subject it will, in effect, become a compulsory subject in the vast majority of schools, although enjoying no more than optional status. Our present object is to alert the public to the disservice that will be done to future generations by depriving them of an education in History for the first three years of their second-level schooling. It is our view that History should remain a required subject up to Junior Certificate level because the study of History is an essential element of education in civic culture to which every future citizen is entitled. We can see no way other than through the study of History how young people can be brought to appreciate the political, economic, and cultural endeavours of the women and men who inhabited this island in past centuries, and neither do we see any other way in which our future citizens can be brought to understand something of the contribution of previous generations of Irish people to the development of a broader European culture and of universal principles. Such an understanding is of vital importance, and it seems self-evident that every young Irish person should, at school, be given a balanced appraisal of Anglo-Irish relations in past times. It should also be noted that the European Union’s White Paper on education and training (November 1995) recognises the importance of History as a subject in the formation of the job-seeker of the next century, while in Northern Ireland every school pupil is required to follow a course in History until age fourteen within a revised curriculum which, for the first time, includes a substantial element of Irish History. This latter inclusion was won after prolonged debate and it would be ironic if what was hard-fought-for to meet the educational needs of pupils in all second-level schools in Northern Ireland should be dropped without discussion from the curriculum of the secondary schools in the Republic. Issues of principle aside, there are pragmatic reasons why History should be maintained as a mandatory subject for the Junior Certificate course. For example, many pupils who study modern continental languages to the senior cycle are reliant on what they have learnt in their History class at junior level to provide them with a context within which to understand European cultural and linguistic developments over time. More immediately it would seem strange that when so much is being made of the economic potential of cultural tourism that our Department of Education should contemplate releasing upon the world a generation who would know nothing of their heritage. 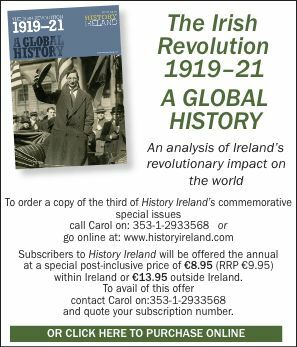 Sir,—As academics who have for the last twenty years been trying to raise the profile of Irish history-teaching in British universities, we should like to express our disquiet at the Education Minister’s proposal to drop history from the core subjects on the Junior Cert syllabus. Since the early 1970s we have seen a developing exchange of ideas between those interested in the subject here and in Ireland; Irish history has just begun to find its way into British university courses; graduate students move more and more easily between the two countries; the tenth Biennial Conference of Irish Historians in Britain has just taken place, a larger and livelier gathering than ever before.